Discussion in 'TalkCeltic News' started by Taz, Sep 10, 2012. It was a chilly Tuesday evening on the south coast of Wales - weather that somehow fit the mood of a nation. Scotland stood on the precipice of crashing out of qualifying for the World Cup, due to be held in Mexico the following summer. To a generation of Scots, such a notion was unfathomable. Scottish Football had ridden the crest of a wave - a wave that had begun with Stein during his time with Dunfermline in the early 60's. It had seen Scottish clubs scale the heights of European glory and be recognized accordingly. It had also seen the national side feature in the past 3 World Cups - indeed, it had been mere goal difference that had seen Jock Stein's Scots eliminated from progressing further in 1982, yet 3 years on there was no such certainty. The wave was first seen as a ripple, as the big man began to make his mark as a tactical genius. Stein turned around an unfashionable Dunfermline club from relegation strugglers to Scottish Cup winners in 1962. The following year his side knocked out Everton from the Inter-Cities Fairs Cup, before inspiring his side to claw back a 4-0 deficit against Valencia by putting 6 past the Spaniards in the return leg at East End Park. Stein was laying down a marker, and it was not just Scotland but Europe that was beginning to pay notice. The ripple became a current and the current a wave. By May of 1967 Celtic, now managed by Stein, were riding high on the crest as they wrote themselves into legend, going on to lift the European Cup, but they were not alone. Scottish clubs in general began to make their own impacts on the continental game. Scottish Football itself was becoming synonymous with an ethos of punching above their weight. And at the vanguard was Stein, leading his side to at least the last 4 of Europe's premier club competition three more times in the next 7 years. The wave had kept rolling, throughout the 70's and right into the 1980's as both clubs and country continued to fly the flag for Scotland across the continent and indeed, the world. Yet by that September evening in Cardiff in 1985 it was in serious danger of breaking. It is somehow appropriate that the man that had inspired, personified and championed the Scottish game throughout this golden era through his achievements with both Celtic and Scotland, was at the helm to chart the course. The nation would need all his wisdom to channel it's hopes and deliver the safe passage needed. 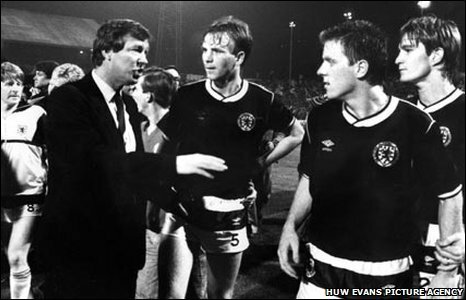 Scotland needed a result that night. They needed at least a draw to stay in the reckoning. Added to this and Stein was without a clutch of his most important players, including Liverpool trio, Kenny Dalglish, Alan Hansen and captain Graeme Souness. Scotland were undoubtedly the underdogs going into the contest. Stein's assistant throughout that campaign was a young man that would go on to carve one of the most glittering managerial careers of all time, much like his mentor. Alex Ferguson would later recall how, with kick off fast approaching that the strain was taking it's toll, etched on Stein's weathered face. And worse was to come. The nerves of the Tartan Army were fraying, along with the manager's, as Wales took the lead after just 13 minutes. The Scottish rearguard cleared a long throw into the box, but the ball fell for Peter Nicholas, who showed good strength to beat 2 Scottish defenders, as they appeared to get in each other's way. Nicholas squared the ball into the box which was met by Mark Hughes, who fired a low drive past Jim Leighton and into the back of the net, to spark wild celebrations among the home support. The situation got worse at halftime, with the Scots still trailing on the scoreboard. Jim Leighton informed Stein that he had lost one of his contact lenses! Left with little choice, Big Jock was forced to sacrifice one of his possible tactical substitutions, with Alan Rough taking up the duties between the sticks. Behind, running low on options and with the expectations of a nation weighing heavily upon him, Stein had just one last chance to lift his deflated charges; to inspire them, to make them believe in themselves. Whatever Big Jock said during that half time team talk it certainly had the desired effect. It roused the side from it's lethargy. The Scots began the second period like a team possessed, forcing the Welshmen further and further onto the back foot and clearly on the defensive. With time ticking away, Stein turned to his bench and on the hour mark made the decision to replace the aggressive Gordon Strachan with the unpredictable Davie Cooper, in the hopes that the winger could find a way to unlock the resilient Welsh rearguard. This one last tactical switch would prove critical as events unfolded for Scotland. With just 10 minutes left on the clock Stephen Nicol launched a long ball forward, which was nodded on by Graeme Sharp to David Speedie inside the area, where Welsh defender David Phillips was adjudged to have handled and a penalty was awarded by the Dutch match official. Whilst this was happening Big Jock looked out from the dugout. Pale and physically worn, Stein was as much a helpless spectator as the capacity crowd and the countless more watching from their favourite pubs and living rooms. The hopes of a nation rested with Stein's substitute. With the ball on the spot, a matter of 12 yards, Neville Southall looming large and almost 40,000 pair of eyes trained on the unfolding drama, Cooper picked his spot and drilled low, into the bottom corner of the net. As the Tartan Army erupted in celebration, a cadre of photographers began to encircle the Scotland dugout. They incurred the Big Man's ire, as he was seen remonstrating with them. A short time later, perhaps believing he had heard the referee's final whistle, Stein got to his feet, only to collapse by the side of the pitch. Few in attendance had any inkling of what had occurred as the match continued, with the Scots holding on against a late flourish from the home side, to earn the draw that was needed. Big Jock was carried to the physiotherapist's room, where it was determined he had suffered a massive heart attack. The Big Man, the man who had first invigorated the Scottish game with a vitality and tactical nous, who had restored a directionless Celtic, created a golden era for the club and inspired a nation, whose level of genius has rarely been seen since at either club and international level, tragically passed away. A stunned nation learned the news shortly afterwards. No one cared about football. As one sombre fan put it 'We'd rather be out of the World Cup and have Big Jock back'. Some might say that it is at times like this, that football doesn't matter. Big Jock would be the first to say that it puts football into perspective, but it still matters. His life ended as he had lived it - though football. To say that football does not matter would be akin to saying that everything that he had dedicated his life to, did not matter. 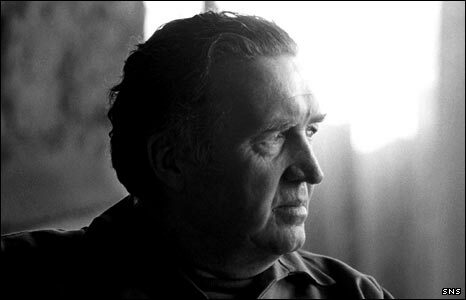 Jock Stein matters, make no mistake. He had given his last full measure of devotion to the beautiful game. Cooper's penalty would see the Scots reach a play off with Australia, in which Alex Ferguson was able to steer Scotland past and got the team to Mexico the following summer. But far more was lost that evening than what could ever be gained. Scotland would qualify for a fifth consecutive World Cup four years later, but the great wave that had sustained Scottish Football from those first splashes at East End Park in 1963, was now fast receding, lost in a wash of unsustainable practices and a culture within the game had shifted forever - and not necessarily for the better. Big Jock would never see these changes. He would not recognize much of the village of Burnbank where he had been born, nor the ethos that engulfed the game after his sad passng. The working class principals dismissed by a culture of entitlement that came with ballooning salaries. He would never see how the hubris of one man would change the direction and the face of the national game, how a sychophantic media would indulge in it, how his beloved Celtic would come so close oblivion before being restored and how a new Celtic Park would rise like a phoenix from the ashes. In a way perhaps, there is a poetry that Big Jock, who gave everything to the game should pass remembered for countess afternoons spent on the touchline of Celtic Park. The years could not condemn his memory to that of faded glory. His is an indelible mark that has stood the passage of time and his enduring legacy is not just seen in the reflection of a piece of silverware that was won back in 1967. No, not even that crowning glory can come close to encapsulating what Jock Stein left behind. Rather it is in the eye of every Celtic fan across the world. The weathered eyes of experience, that watched the Big Man guide his team to glory and shape a new generation to carry forth the tradition. The soft eyes of reflection, which ponder upon the achievement of such marvelous deeds. The eyes of youth that gleam with reverend awe on stories their grandfathers may tell. All with a singular name on their lips and that wisp of deep affection in those eyes, irrespective of the bearer. As Bill Shankly famously commented, "Jock, you're immortal now." Rest in Peace, Big Jock. "Some say people worshipped big Jock, but it's better than that. People loved him." "For people like myself, Jock was the precursor of all the deeds and challenges we needed to aim at. He would never take the praise himself. It was always about the players and how great the team were. That magnanimity tells you everything about him. 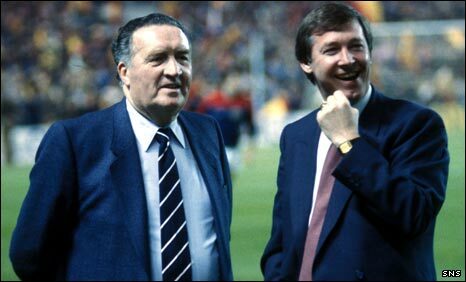 For any man seeking to further his education in football, Jock Stein was a one-man university." Southall, Van den Hauwe, Jones, Ratcliffe, Phillips, Thomas (Blackmore 83), Nicholas, Jackett, Rush, Hughes, James (Lovell 80). Leighton (Rough 46), McLeish, Malpas, Nicol, Miller, Gough, Strachan (Cooper 61), Aitken, Speedie, Sharp, Bett.